Co-Executive Producer of the hit E! 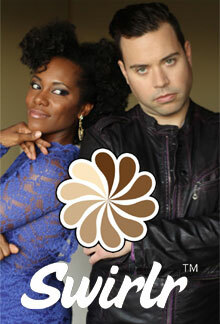 reality series, “Ice Loves Coco,” and dating powerhouse InterracialDating.com, bring viewers a new series about dating different, titled “Swirlr.” The official trailer will premiere at the Swirlr.com launch party in Hollywood, CA on February 14th, to be followed by the online release available at Swirlr.com. "Swirlr," is a groundbreaking web series that features singles opening themselves up to finding love outside of their own race and/or culture. New webisodes to be released weekly on Swirlr.com via YouTube. "Swirlr" is hosted by Christelyn Karazin and Jordan Harbinger. Christelyn is co-author of the book "Swirling: How to Date, Mate And Relate - Mixing Race, Culture and Creed", and Editor of the popular blog, BeyondBlackWhite.com. Jordan is a dating and body-language expert and co-founder of The Art of Charm. "Swirlr" begins with our relationship experts, Christelyn and Jordan, consulting two clients who are looking to expand their dating options in the quest for love. From a pool of multicultural singles, Christelyn and Jordan choose three candidates for each client, based on personality and compatibility. Then the clients go on a series of dates that will hopefully lead to love.